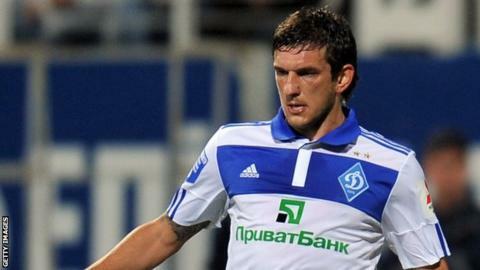 West Brom have completed the signing of Macedonia international Goran Popov on a season-long loan from Dynamo Kiev. The deal includes an option for a permanent move at the end of the loan. But the 27-year-old left-back will not be available for West Brom's clash with Everton on Saturday. "Goran is a player the club have closely monitored for around three years so we know what we're getting," head coach Steve Clarke told the club's official website. Popov was granted a work permit and completed a medical on Friday afternoon to become the Baggies' sixth signing of the transfer window. The Macedonian, whose proposed loan move to Stoke fell through earlier this month, will provide competition for Liam Ridgewell at left-back after Nicky Shorey and Joe Mattock left the club in the summer. "He has also given up the opportunity to play Champions League football with Dynamo Kiev to join Albion in the Premier League and he's determined to do well here," added Clarke.